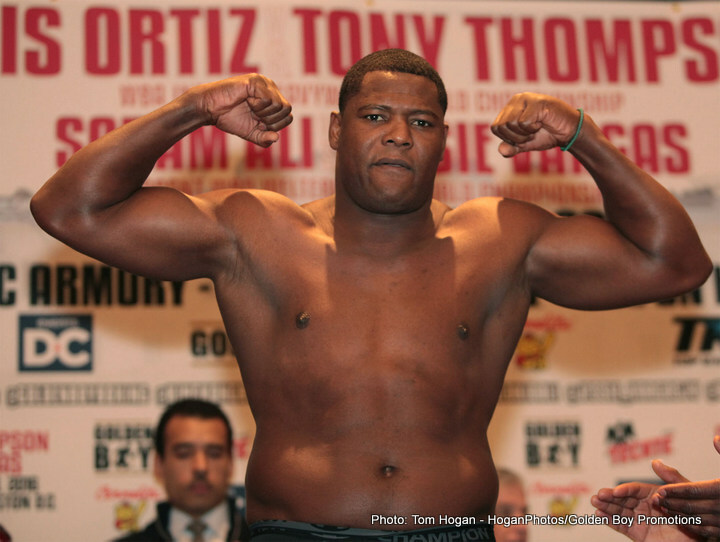 By Dan Ambrose: Unbeaten interim WBA heavyweight champion Luis “The Real King Kong” Ortiz (24-0, 21 KOs) has a showcase fight tonight against 44-year-old Tony Thompson (40-6, 27 KOs) on HBO Boxing from the DC Armory in Washington, DC. This is not considered a competitive fight in the eyes of a lot of fans, so Ortiz has got to shine because he’s expected to win handily by a knockout by the 6th. Thompson was only selected by Ortiz’s promoters at Golden Boy Promotions because they couldn’t get anyone else to agree to take the dangerous fight. This is at least a fight where the fans get a chance to see the 6’’4”, 242lb Ortiz face someone his own size more or less in the 6’5”, 263 3/4lb Thompson. One thing about Ortiz in this fight is how he’s putting on weight, and not the good kind. Ortiz weighed 239lbs for his last fight against Bryant Jennings last December. Now it’s three months later, and Ortiz is heavier at 243. Looking at Ortiz’s midsection, it looks like he’s put on a little weight. Ortiz started his career in 2009 at 233lbs. He’s been as low as 217lbs at point, but he’s steadily putting on weight. Thompson is getting fatter too, but he’s heading towards journeyman status it’s not as important. If Ortiz wants to have a chance against the better heavyweights in the division, then he’s going to need to slow down his growth around his midsection and instead slim down a little. What he doesn’t need is to become the next Odlanier Solis. That’s a Cuban heavyweight who won a gold medal in the 2004 Olympics. As a pro, Solis has been as high as 271 pounds on a 6’1” frame. This the same fighter that Thompson beat twice. I’m not saying that Thompson is going to beat Ortiz tonight. I am saying that Ortiz needs to get control over his weight because he could wind up too flabby to win fights. He’s already got a strike against him in he’s about to turn 37, and he does not look like a young fighter. That’s even more reason why Ortiz needs to keep his weight down so that he doesn’t balloon up into the 300s. It’s got to be hard though for heavyweights like Ortiz, because once they start making the good money in fights that are televised on HBO, the tendency is to relax and live good. You can’t do that as an athlete. Once that weight is put on, it’s often the beginning of the end for fighters. Hopefully that’s not the direction that Ortiz is heading in. Once he loses his speed and mobility, he’s getting to be a sitting duck for the more mobile heavyweights like Tyson Fury to easily beat. The line Bovada has on the fight is Luis Ortiz -5000, and Thompson +1400. Thompson doesn’t have much of a chance in this fight. Without the punching power, he’s going to be at the mercy of Ortiz. The only way that I can see Thompson winning the fight is if he takes Ortiz into the deep waters and drowns him late in the fight. Ortiz has never been beyond the 8th round before in his career. In fact, he hasn’t been to the 8th round since 2010, when he was younger, lighter and more mobile. The fighter that existed in 2010 is no longer around. Ortiz is a lot slower and fatter than he was back then. He’s now sporting a slight paunch around his middle, and he’s lost a couple of steps. When Ortiz was an amateur, he would lose to fighters that set a fast pace. He would tire out quickly and have nothing left by the third round. If Thompson is able to set a fast pace tonight, he could in theory wear Ortiz down and get either a stoppage or a decision win. Ortiz is carrying around more groceries around his midsection, and Thompson could take advantage of that new fat on him. A loss for Ortiz in this fight will wreck Golden Boy Promotions’ plans of turning Ortiz into a world champion in the near future. Ortiz would have to get back in line and slowly work his way back to where he is right now. He doesn’t have much time though because he’s clearly aging and I doubt that he’ll be able to hang around at the top for too much longer.